I'm a big fan of websites like GUIdebook and the toastytech GUI gallery that collect screenshots of old desktop GUIs. I think it's interesting to travel back in time and take a look at how GUI design has changed over the years. I'm particularly interested in early Linux desktop environments and window managers. 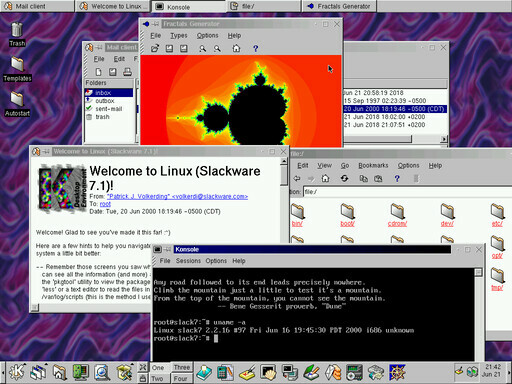 One such desktop environment is KDE, which had its 1.0 release almost 20 years ago on 12 July 1998. Sadly, KDE 1 and other early KDE (as well as GNOME and XFCE) releases are missing from GUIdebook and toastytech. So I tasked myself with finding, installing, and documenting those old releases. It seemed the easiest way to do that was to find an old release of a Linux distribution that includes one or more desktop environments. As it turns out, it's not exactly easy to figure out which contemporary distributions included which versions of which desktop environments. I ended up picking Slackware since it began including KDE 1.1 from version 7.0 (and also included early versions of GNOME and XFCE in later releases). I've previously used Slackware 12.0 with KDE 3.5, so I'm already somewhat familiar with the installation process which hasn't changed much over the years. Additionally it's fairly easy to find ISOs for early Slackware releases online (e.g. just search for slackware 7.1 iso and you'll find it on several mirrors). I'm now in the process of gathering screenshots of desktop environments and applications from several different Slackware releases that I've downloaded and installed in VirtualBox. The screenshots will (eventually) be available in the new GUI section of my website. So far I've added a page full of screenshots from KDE 1.1.2 on Slackware 7.1. There isn't much to say about this one. 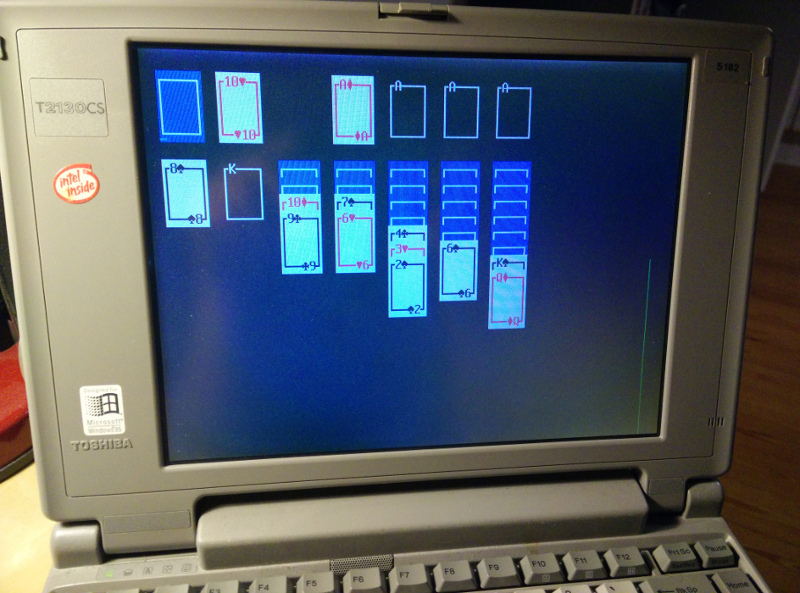 It started out as a desire to play Yukon in a terminal – I could only find a few implementations of Klondike. So I created yuk, a simple ncurses-based Yukon implementation in C. I then realized that most of the code could easily be reused to implement other games, such as Klondike and Freecell. The result was csol. A game of Yukon in csol. 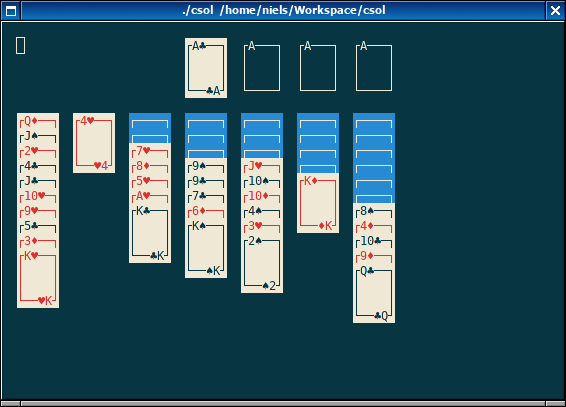 At the moment, csol includes 5 different solitaire games: Yukon, Klondike, Freecell, Eight Off (very similar to Frecell), and Russian Solitaire (very similar to Yukon). They are implemented in a simple declarative language I designed for csol. It should be possible to implement a lot more games using it, but unfortunately I don't know that many different solitaire games. csol also has support for different themes using the same declarative language. Some more screenshots of games and themes, as well as the source code, are available on the github repository. As usual, I've also created an aur package. 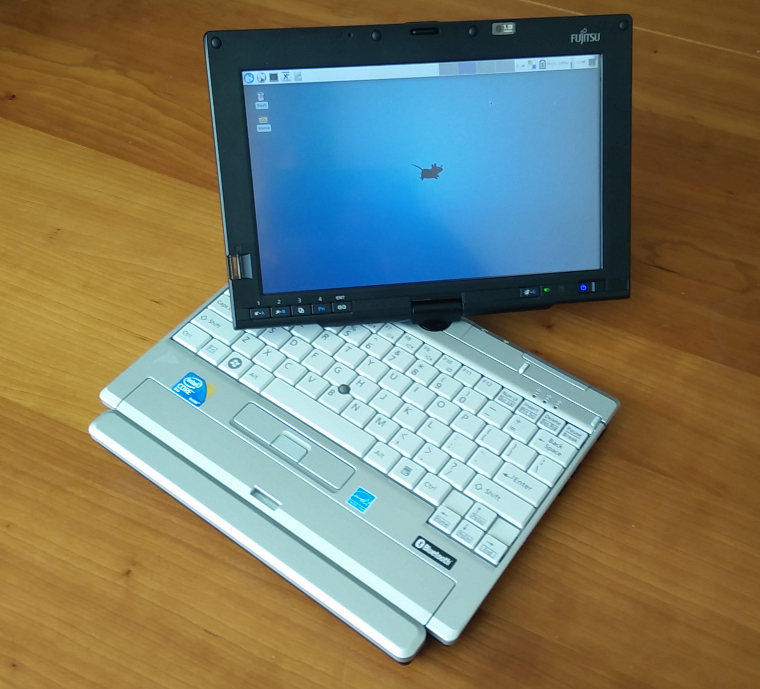 A Fujitsu LifeBook P1630 running Arch Linux with Xfce. I recently bought a somewhat old convertible tablet PC for $65 USD on eBay. The Fujitsu LifeBook P1630, which was originally sold for more than $2,000 USD back in 2008, is a small laptop/tablet PC with a 1.2GHz Intel Core 2 Duo and an 8.9″ resistive touchscreen display (1280×768). Size-wise it is similar to the netbooks (like the Asus Eee PC) that were starting to get popular at the time, but it is definitely much more powerful than the early netbooks (and also much more expensive at the time of its release). Although it was originally sold with Windows Vista (and mine came with Windows XP Tablet PC Edition), I immediately decided that I would put Linux on it, partially because I was curious about how well Linux would work with a touchscreen (Android doesn't really count). Speaking of Android, the P1630 is a bit different from modern tablets: Like other older tablet PCs it has a resistive touchscreen instead of the capacitive touchscreen found in smartphones and most post-iPad tablets. This means that the touchscreen can only be used with sharp objects, like the plastic stylus that comes with it (or fingernails, but that feels a bit awkward). The unit I got was in pretty much perfect condition, and doesn't have any visible scratches or marks on the case. It certainly doesn't look like an 8 year old computer, so it probably hasn't been used much. The only problem listed in the eBay listing was a BIOS password unknown to the seller. I decided to buy it despite the BIOS password, since I assumed it could be reset one way or another (and I was right). It also didn't come with an AC adapter, so I had to throw in another $10 for an unoriginal AC adapter from China. Ever wanted a simple calculator within Vim? Since vimscript is already a fully featured programming language, you've already got it! For instance you can type :echo 2 + 5 in normal mode and get the result 7. You can also enter Ex-mode by typing Q in normal mode. In Ex-mode you can type commands without first typing :, however you still have to type echo to print the result of expressions. When in insert mode you can also press <c-r>= (an equals sign should appear in the bottom left corner) followed by a vimscript expression. This inserts the result of the expression at the current cursor position. You start it by pressing <leader>c in normal mode (or :call Repl()). I use space as my leader (let mapleader = " "), so by pressing space followed by c a prompt displays at the bottom of the window. To exit the REPL, you type q and then press enter. Any expression you type while in the REPL is evaluated. The result of the expression is printed and saved in the ans-variable, so that it can be reused in the next expression. When Vim is compiled with floating point support (:echo has('float') returns 1), you can also do floating point arithmetic. That's about it. It's pretty simple, but it can be quite useful when you need to do a couple of calculations.